Here in Northern Illinois, it is starting to feel like autumn is drawing to a close. The nights are getting colder, the days shorter, the trees more bare. In the gardens, the season is nearly over: the last day we are open to the public is this Sunday. We are no longer so concerned with clearing the paths of leaves—there are fewer leaves to clear, and fewer visitors to mind them. Instead, we are guarding against the cold. At the end of each day we check each of the dozens of outdoor water spigots that dot the gardens, making sure that there is still a steady dripping of water from each one, making sure none are frozen. We check the heat lamps that stand sentinel over the many water pumps, and we throw tarps over outdoor valves to blanket them and keep them warm. 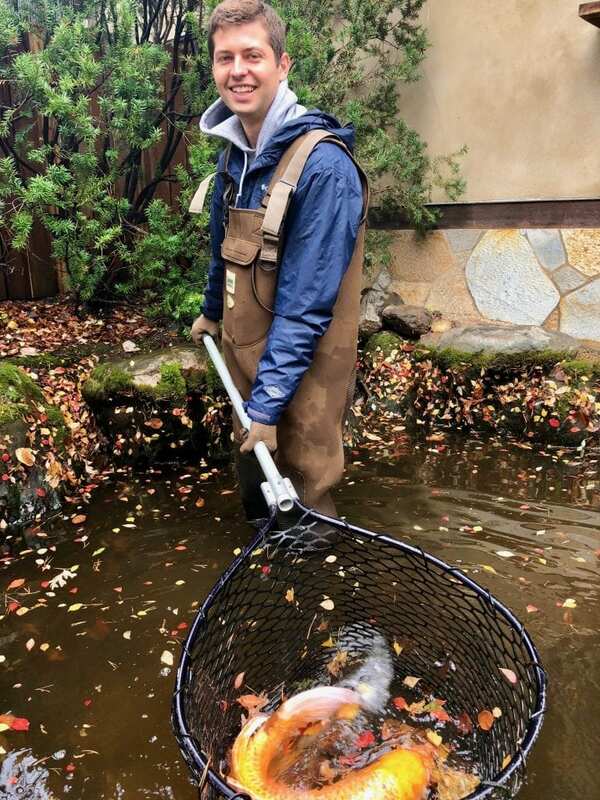 This week we have also been catching koi and moving them from the smaller ponds (the one by the the Guest House, and the one by the West Waterfall), to the two larger ponds, where they will spend the winter, hibernating beneath ice. We caught a few strangers too, chubs and blue gills, which were carefully carried to and released in Spring Creek. I wrote a haiku back in mid-September, back when the trees were still leafy and green, the air was still warm, and there were still mosquitos buzzing around to bother us. Hardly any trees had begun to change then, just a few yellow ones here and there. Now, the show is almost over. How quickly our glorious fall flies by us. I hope this haiku can be like a little dream, a reminder of the early fall, the leafy green, the calm; and of all that has passed in just a few short weeks, all the blaze of color, the steady cooling of temperatures; and I hope it can lend some perspective as we stand on the other side of all the changing, stunning beauty, and face the snow and cold to come. Before we know it, it will be spring again.